Ashfaq Ahmed, PP, SI (Punjabi: اشفاق احمد) (August 22, 1925 – September 7, 2004) was a distinguished writer, playwright, broadcaster, intellectual and spiritualist from Pakistan. His prime qualities of heart and hand earned appreciations across the world. He was regarded by many as the best Urdu Afsana (short-story) writer after Saadat Hasan Manto, Ismat Chughtai and Krishan Chander following the publication of his famous short-story Gaddarya [The Shepherd] in 1955. 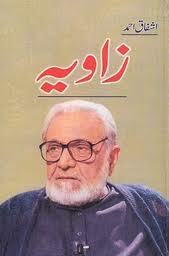 Zavia 1, Zavia 2 and Zavia are the famous books of Ashfaq Ahmad. These books actually are programmes which on aired on PTV.